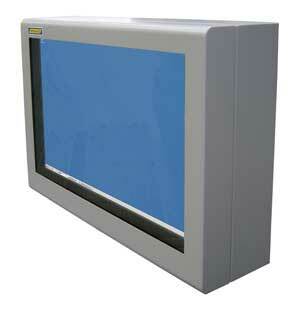 Plasma Enclosure - Protection for digital displays in harsh, public or Outdoor environments. Plasma Enclosures for outdoor protection ranging from 24" up to 50"
A plasma enclosure offers a variety of options for digital signage purposes. 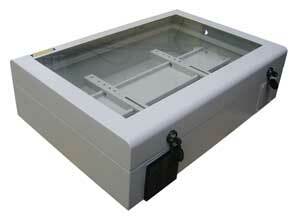 Our range of plasma enclosures allows the use of plasma displays in all sorts of environments. Built to European and International guidelines, they offer the perfect solution for plasmas displays in harsh, public or outdoor environments. Built to accommodate a large variety of commercial plasmas displays from 28" (71cm), 32" (81cm), 42" (106cm) and 50" (127cm), we can also provide an option to install a thin client or dedicated PC to control the plasma device if required. All plasma enclosures are built with dustproof and waterproof applications in mind and are designed for both indoor and outdoor use. All our plasma enclosures are designed to European IP65 or IP 66 standards (the US equivalent - NEMA 4), ensuring protection from water and dust. They are also well insulated allowing their use in temperatures below -30° with the option of additional air conditioning units that allow the plasma to be used in excessively hot environments too. Constructed from either mild or stainless steel with a clear, protective polycarbonate screen and Armagard plasma enclosure can be wall, ceiling or pedestal mounted and can come complete with all brackets, fixtures and fittings. Sealed lockable and secure an Armagard plasma enclosure offers the best solution to protect your plasma display from theft, vandalism and the damage caused by harsh industrial environments.